In Brazil, more or less in 2011, was created a magazine like Shonen Jump called Ação Magazine, and one of the comics was based in Initial D. Called "Tunado" (Tuned, in free translation) have your story in São Paulo. The main character is Daniel Kawasaki, nephew of legendary stock car driver, and street racer, Roberto Satoichi Kawasaki. Because of an accident years ago, Roberto became paraplegic and left the races. But, seeing the passion of your nephew in races, he gives the keys of your Chevrolet Chevette to Daniel become the next legendary street racer. Unlike his uncle, Daniel's father is a cop and dislikes street racing. 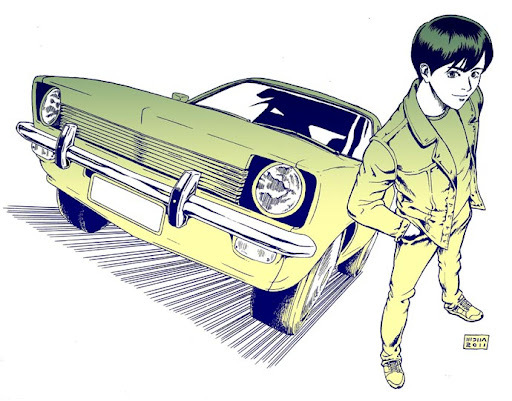 The comic is totally full of Initial D references, and a bit of Fast and Furious movies. The first Daniel's race is too much similar too Takumi x Keisuke. Sadly the comic was canceled with the magazine, only with three chapters. One of the creators, Maurilio DNA, posted on his Issuu page the pages + the preview comic (Brazilian Portuguese). In Brazil, it's common we say Chevette is a"Brazilian Hachi Roku", because is one of few RWD cars selled here.